I’m privileged to work with many talented tax professionals—some are the best minds in tax. Our advisors tackle complex planning for many of the wealthiest families in America. Graduate degrees and credentials acquired over years of practice include CPA, MT, JD, LLM, PFS, CFP, and MBA. However, when we asked children at Philadelphia’s Mighty Writers to give us their interpretations of taxes, their answers reflected a surprisingly good understanding of the subject, despite their lack of financial or legal education. Before we give you their responses, a little on Mighty Writers and how The Tax Warriors® became a big fan. 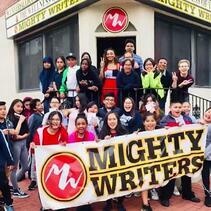 Mighty Writers is a writing academy for children in Philadelphia and Camden. Led by Executive Director Tim Whitaker, a former Philadelphia school teacher and writer, the organization focuses on improving the writing skills of children through their teen years. And, what a job it does! Last year, Drucker & Scaccetti contributed to the Mighty Writers and got to know Tim and the great work of the instructors. Mighty Writers helps kids think and write with clarity and they help kids appreciate and love the written word. The concept of taxes is simple: collect money from citizens to pay for things society needs. The Mighty Writers have captured the essence of taxation’s intended simplicity. It’s when our government and special interests devise ways to apply the code, and deciding to whom it applies and why, that things can get complicated and, sometimes, unfair. We’d like to thank Mr. Whitaker, Naomi Levecchia and the entire team at Mighty Writers for their hard work and volunteer time in making our children better writers. You can learn more about them at www.mightywriters.org and see for yourself why The Tax Warriors® at Drucker & Scaccetti supported them. It’s a worthwhile cause and a positive investment in our city’s youth. *The children in this blog post and in the photograph have signed waivers with Mighty Writers to have their work published and attributed to them as authors and to have their photos used to promote the organization.